It is great to see both cities of Toronto and of Mississauga investing in public transit. 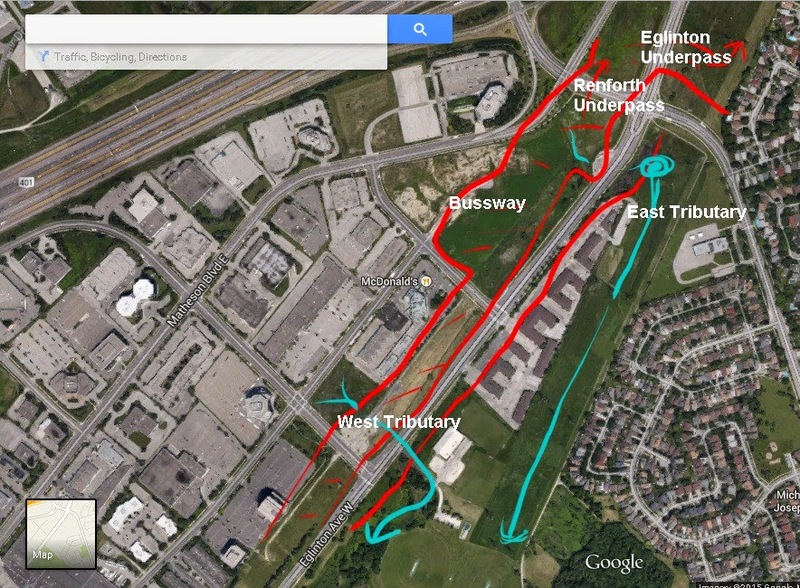 The Mississauga bus-way and Toronto Smart Track will meet roughly at or slightly above the headwaters of Jackson Creek. It will be an impressive and useful structure of steel and concrete. The concern of Friends is that the pave job will speed up the flow of storm water and increase the destruction and erosion downstream. Many would remember the freak rain storm of summer 2013. It took down all of the trail bridges down the Renfoth Creek below (one of which is still dismantled), severely damaged the downstream paved trail on Etobicoke Creek and altered its route (at the time of the article a potion is 'bitten' off in the Browns Line area), and rendered unusable the lower Mimico Creek trail below Bloor St W.
Speaking with helpful representatives of the project at the open house, I learned that the municipalities have a storm water agreement, where the water that falls on Toronto's side will go to Mimico Creek and Mississauga's into Etobicoke Creek. 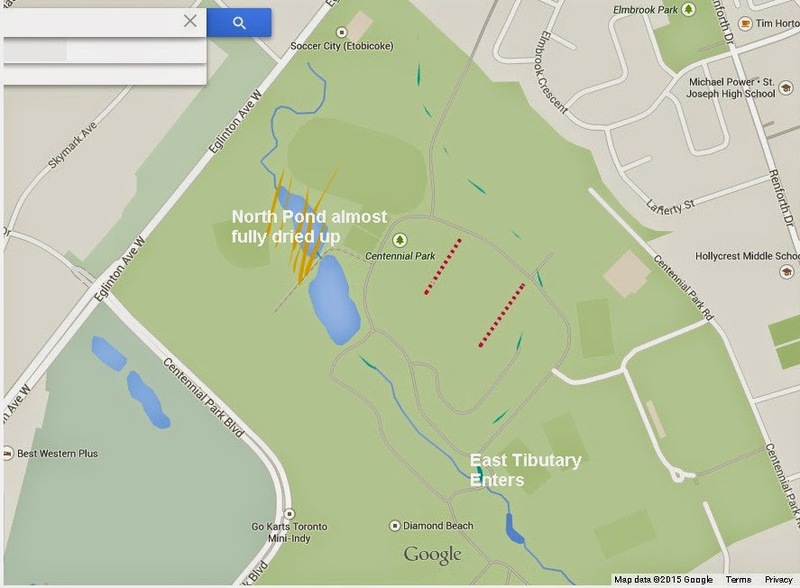 This may lower the impact on Renforth Creek, but worsen the situation with the other ones. That is because, the water will have no chance to be absorbed by the soil and trees and will be rushed directly into and through the ravines. 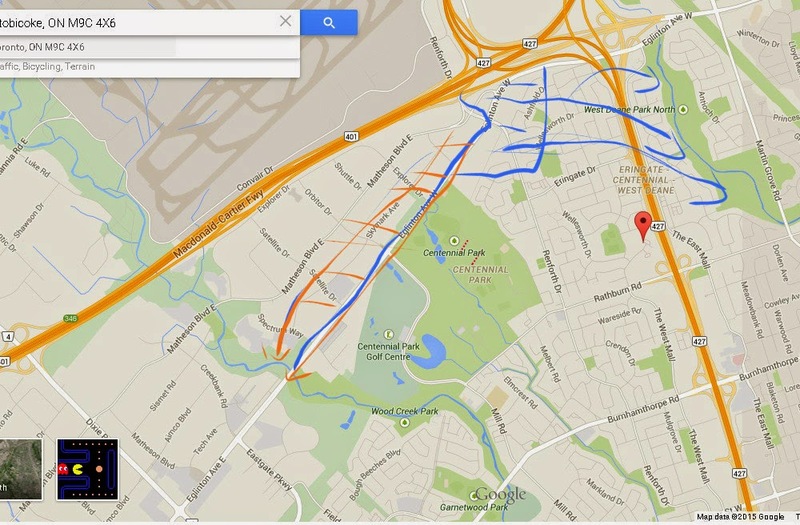 The Mississauga's project cuts though the headwaters of what is now Renforth Creek. In the project area, there were at least 3 mini ravines with intermittent or constantly trickling flow that culminate into the said creek. There were mature willows lining those banks respiring and using the water. Now, sadly,everything is bulldozed and cut. The project will involve underpasses and underground structures, meaning that the hydrology of the area will be seriously affected. Already, the upper pond in Centennial Park is dried up. When I raised this issue, the presenters quickly pointed at the pretty flower beds and new tees on the artist's rendering of the future structures. Friends welcome the new trails and conveniences of the project, yet are concerned by the destruction of the natural heritage which may also lead to public and private property damage during storms. 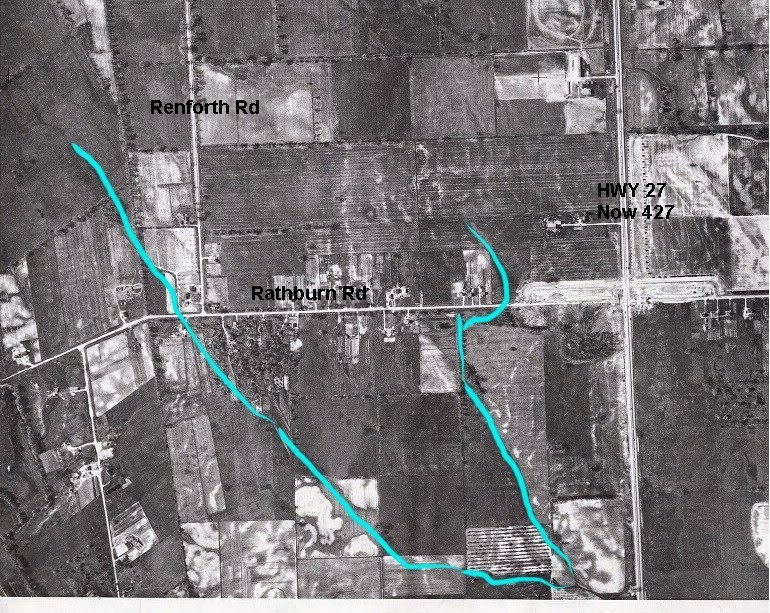 It is worth reminding that during Hurricane Hazel of 1954, Jackson Creek flowed freely above ground, allowing the waters of Central Etobicoke to slow down, evaporate, be taken up by vegetation and so on. Friends urge the developers to work with nature when it comes to storm water management and not to pipe away the waters. It is much preferable for our creeks to serve cultural and recreational function, while draining the waters as it did so over thousands of years (working with and shaping the landscape). Also worth reminding is that almost every beech in Toronto is a Blue Flag one. Our Sunnyside and Long Branch fail to make the cut in pat because here, we push our waters into our two creeks, preventing proper UV treatment by sunshine or by bacteria in a slower moving water. Thanks for reading and remember to spread the word.